I’ve done it! As if by magic, I’ve managed to complete my skelecs (to the lowest point of completion) and have a go on them before leaving home for university. This post is currently being written from my new house in Nottingham! Sorry about the fact its night time! I was so excited after finishing them that I just wanted to get a video done so I got my sister to record me. 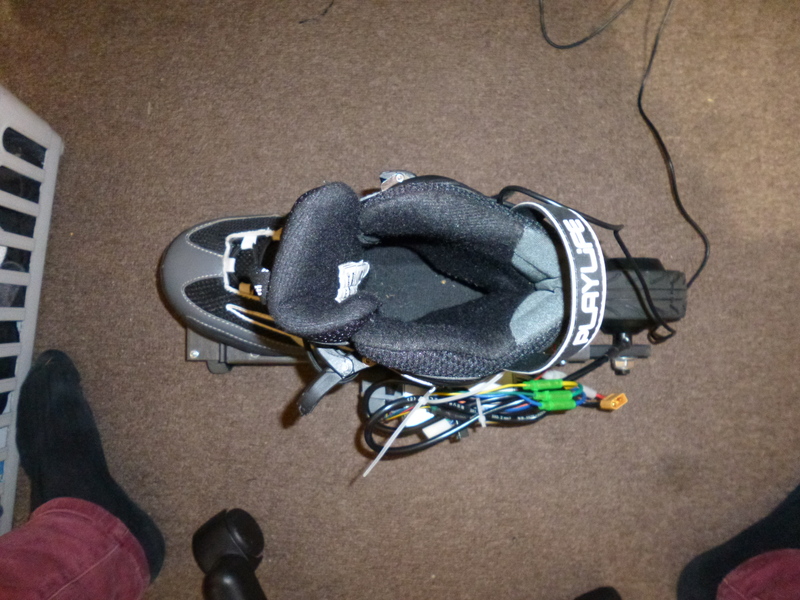 I have since reversed the skates so the steering is now executed from the front instead of the back (swapping the boots around. I’ve also now attached the controllers and made some (preliminary) methods of holding batteries. Unfortunately, I got a bit cocky in Nottingham and while going over the uneven road surfaces, shook loose one of the batteries, which then fell out of its holder and banged on the road! Fortunately, there were no dents or cuts on the battery, just a bit of damage to the heatshrink, thanks Turnigy! I did however sustain a minor thumb injury (boooo… it bled for way too long!). Now it may be quite surprising that they have boots! 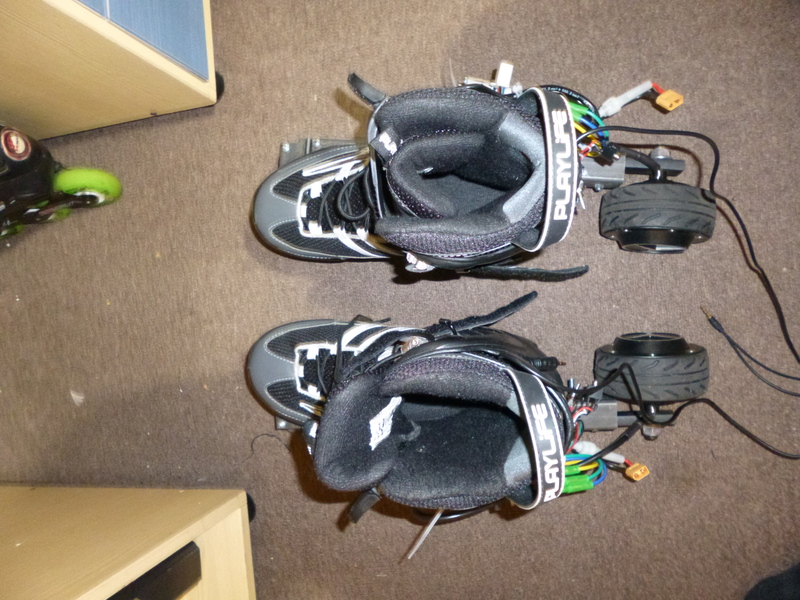 A couple of months back, I did a trade with my girlfriend: my K2 skates, for her (at the time, oversized) Powerslide Playlife skates. I had since upgraded to a pair of Sebas! 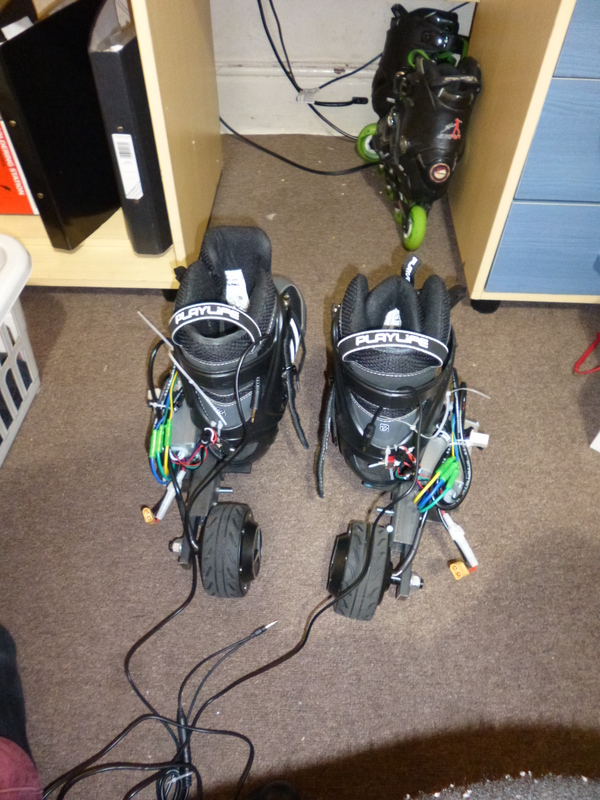 Kindly (though with her permission…), I decided to use her skates as the boots for my Skelecs. They attached to their original frames with a bolt through the toe section and two horizontal bolts at the rear, attaching to a seperate frame block through a vertical bolt at the heel too. To ensure the boots would fit on my Skelecs, I had to drill 2x holes (toe and heel) into my steel plates; two M6 bolts and a few washers and the boots were attached! Always the pessemist eh Harris? Nope! While I may have managed to complete the Skelecs before my return to Nottingham, there wasn’t much effort put into the actual design as I just wanted to chuck an idea into production and test it out. Centre of gravity: One of the most important points of skating I guess, balance! While the skates are well balanced front to back (pictured above), the skates have pretty poor balance between the inside and outside edge. This is quite an issue as this makes it hard to just stand straight! I could rectify this issue by extending the length of the front angle and moving the outside castor further outside. Control: Currently, I’m controlling the two controllers with a wired controller consisting of a slide potentiometer, a 3.5mm splitter and 2x 3.5mm cables. I have been designing a wireless version of this controller so this will be soon to come! Battery mounting: This was an annoying one! 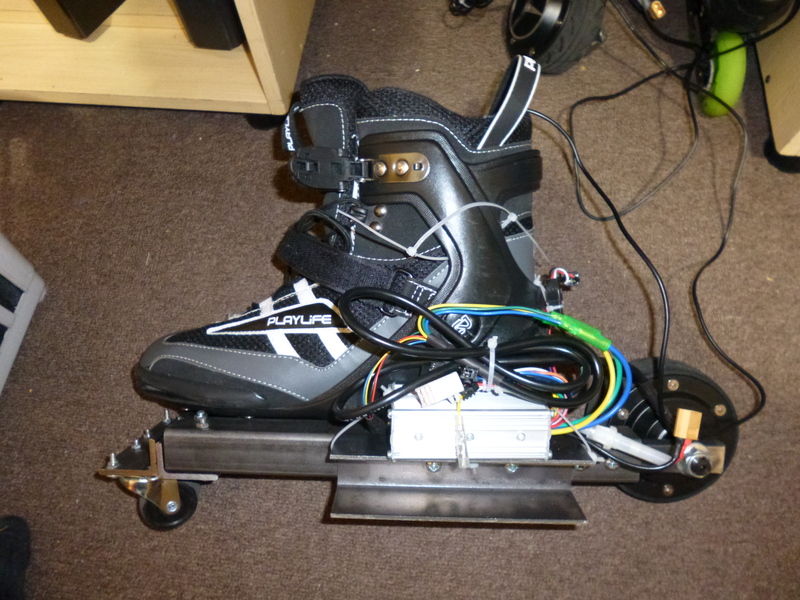 I’d originally intended to mount the batteries in the U channel on the side of the skates. Unfortunately, the batteries were about 6mm too long! 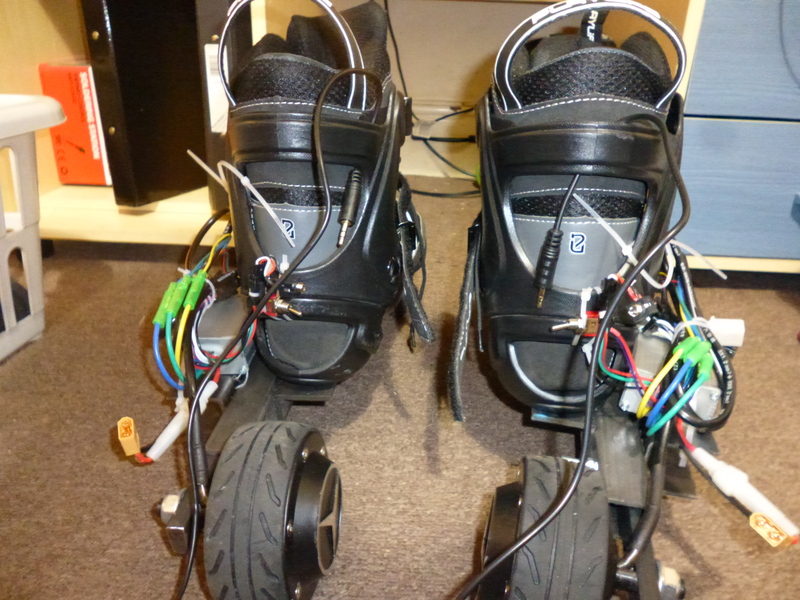 A quite major issue considering the skates like to rest on the U channel when standing (unless the front castor wheels are turned out). 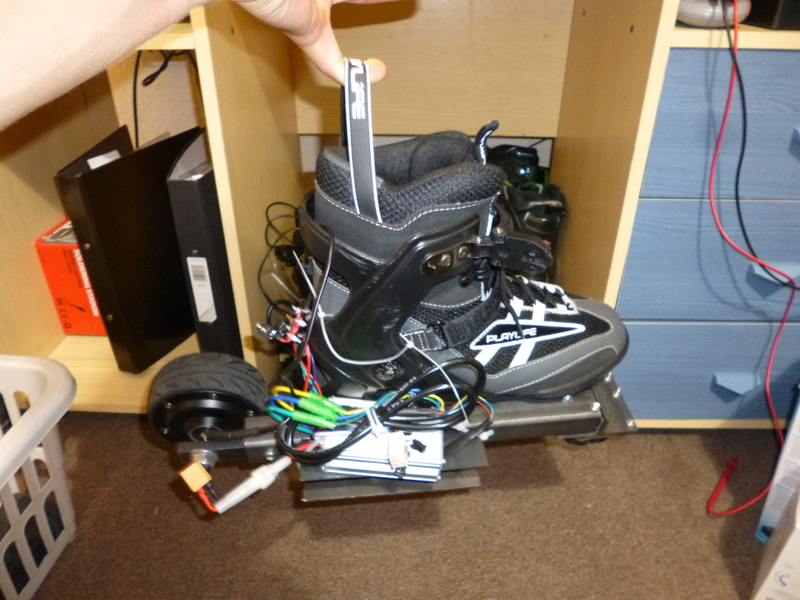 My current temporary solution to this is mounting the batteries in cable ties against skate boot, something that didn’t really work on rough terrain. Front castor wheel size: Miniature castor wheels don’t take kindly to rough terrain! Regardless of the terrain, they always suffer caster flutter, along with them sometimes getting straight out jammed because the spacing between them was too small. They’re also a real strain on the legs as you’re always fighting any gradients of whatever you’re riding on, to try and maintain your target direction. Its not all doom and gloom! Most of these issues are merely teething problems and I’ve got quite a lot of solutions to these problems. First and foremost, centre of gravity and the front castors. These two problems can be rectified by a change to the front section. How am I going to change this I hear you say? Omniwheels! What are omniwheels? Only about the strangest looking ideas of wheelception ever, wheels within wheels! These are the best replacements I could find for my castors, exceeding the omniball idea. They allow easy motion in one predefined direction with slightly less easy (but not harder…) movement in perpendicular directions. This allows me to still turn as I expected without having to wait for the castors to align to the direction I want, solving predominantly the turning issues. 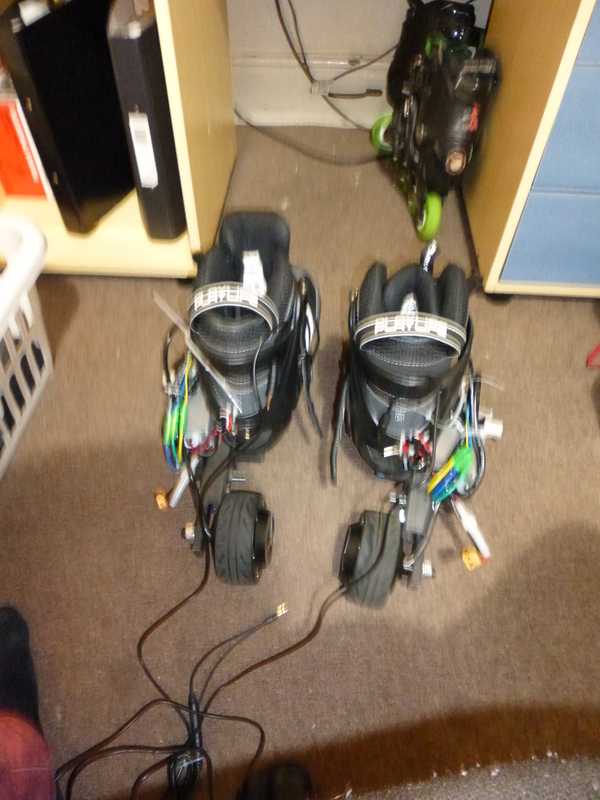 I’m hoping I can convert the skelecs into proper inline skates with a single omniwheel at the front, though I have purchased 4x omniwheels incase I need to keep this reverse trike like configuration. The omniwheels do however come from a specialised company in Australia so I’ll be waiting for their delivery over the next week or three. To conclude: I’ve finished the Skelecs until the arrival of my omniwheels, I’ve managed to ride them, show them to my friends, injure myself and learn a lot about working with mild steel. I wouldn’t call them one of my cheaper projects (at all, the hub motors alone are ~£75 each!) but they’ve most definitely been one of the more fun and interesting projects! Keep tuned for more projects and updates!